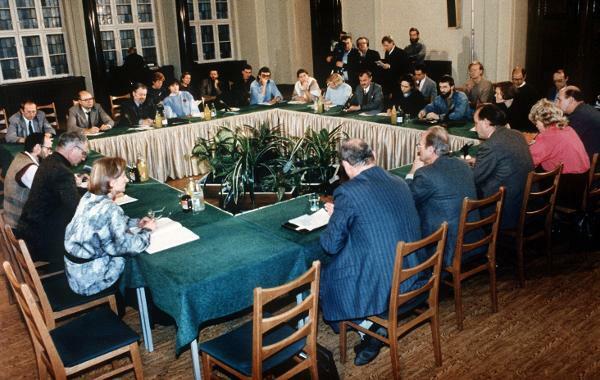 One day after Egon Krenz resigned as chairman of the Council of State of the GDR, the Central Round Table [Zentrale Runde Tisch] was founded in East Berlin. It was a forum in which members of crumbling Communist organizations (e.g., the Socialist Unity Party, block parties, trade unions, and the women’s league, etc.) came together with representatives of the popular citizens’ movements (e.g., Democracy Now, Democratic Awakening, the Greens, the Initiative for Peace and Human Rights, the New Forum, the Social Democratic Party of Germany, and the United Left) to discuss and advance reforms in the GDR. In the beginning, participants in the Central Round Table hoped to reform the German Democratic Republic and thus retain the country’s independence. During their first meeting on December 7, 1989, they decided to dissolve the Office for National Security (the organization that succeeded the Stasi), to hold elections for the East German Volkskammer on May 6, 1990 (the election was eventually moved forward to March 18, 1990), and to draft a new constitution. The last goal came to nothing, however, since the German Democratic eventually acceded to the Federal Republic.